Briana is such a delight to be around. She brings her love for the environment into her work with a mindful photography. This attention to detail is so helpful especially in wedding photography! She’s so passionate about what she does it spills through into the photos. She was also really patient when giving us direction on posing during the shoot. Our photos look amazing, just breathtaking! I’ll definitely have her do more photos in the future. Briana is an incredible photographer. My husband and I had our engagement, wedding and maternity photos taken with her and have loved all of them. She is most definitely our forever photographer! Not only is she an amazing photographer but she is such a genuine, kind soul. I recommend her every time someone, especially brides, is looking for a photographer. If you are looking for a down to earth photographer who makes you feel confident in front of the camera, Briana is your girl! My husband and I hired Briana shortly after standing up in a wedding that she photographed. 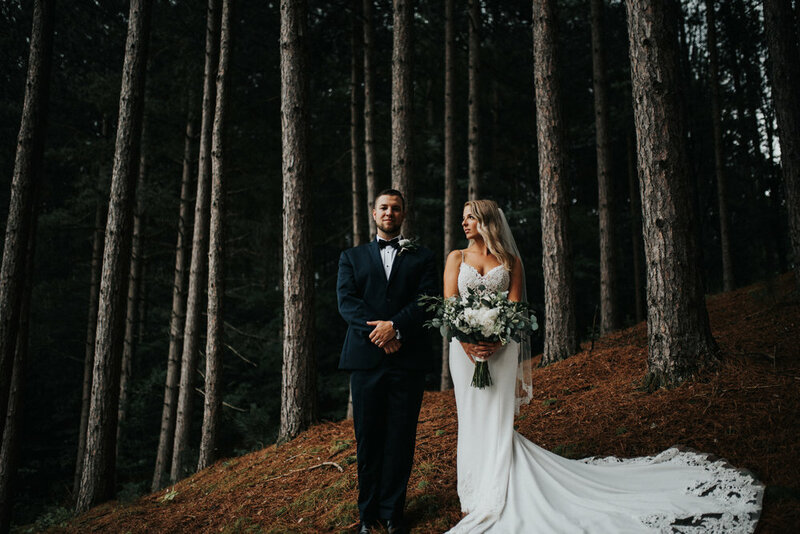 We were so impressed with her work, personality and attentiveness that we knew we had to book her for our own wedding (we didn't even meet with anyone else!). Briana is honestly INCREDIBLE. By far, she was one of my favorite wedding vendors. She has such a warm personality and it really makes a measurable difference on the big day. I've heard from a lot of friends that often times, wedding photographers can be intrusive and can waste a lot of your time posing your loved ones. But, Briana was the exact opposite of this. She basically let the day unfold naturally and captured the most real and candid moments of our wedding. Not only was she a pleasure to work with day-of, but the product that she delivered to us was AMAZING. My husband, family, friends, and I were all amazed at how well our photos turned out. We loved them (and our engagement photos) so much, that we have a huge gallery wall exclusively for Briana's work in our home. We absolutely adore her! Briana was so amazing with our family photo shoot! We had a tired and cold toddler who was fussy the whole time but she was so patient and worked her magic - you would have thought our toddler was having the time of his life in her photos :) she captured some special moments of us and we were so pleased with her candid shots. Her style is so deep and organic, it’s exactly what we wanted and Briana absolutely delivers. Will hire her again! Briana is brilliant behind the lens and can simply capture a beautiful moment that turns into a life story forever. She has taken many magical photos of my family that I will always treasure and love dearly. Briana was an incredible photographer for the first photoshoot I have done. She makes you feel the way you want to, helps you connect deeply and photogenically with your significant other, and makes you comfortable in your own skin. As an artist myself, I can tell that Briana is far more than just a cookie-cutter wedding photographer. She has the knowledge of the trade, eye for composition, and has mastered the use of her tools to capture the emotions a photographer needs to make you look like your best self. Best choice hands down. Where do I start? Briana was single-handedly the best decision I made (regarding vendors and details) on my wedding day. She spent months getting to know my (now) husband and I. We live in Chicago but I was born and raised in Michigan. When she was living in Michigan, Briana even made a trip to my moms house in Michigan and spent time getting to know my family and had lunch with us. She wanted to make sure she knew exactly what I wanted. She flew to Mexico to capture our wedding in Cancun. The pictures are UNREAL. I get compliments on the photos all the time. She has become so much more than a photographer to me- she is a friend. She was the calming presence on your wedding day that every bride deserves. I cannot wait to work with her for many years to come. I promise you will NOT be disappointed. Briana is such a special soul, so creative and an amazing communicator. Her eye for photography is something that is so rare. Unbelievable style, very unique and her instructive lighthearted comfort during photography gave my husband and I the ability to really be ourselves in front of a camera. THIS IS SO IMPORTANT. Our engagement photos were everything we wanted. She then travel thousands of miles for our elopement to the virgin islands and captured such memorable moments to take back home with us. That we were able to share with our friends and family. Briana Then came to our reception party and proceeded to make an impression on all of our guests as she photographed our loved ones enjoying each other’s company. It all shows through the photos that she took. Every dollar that I spent having Briana photograph me and my husband was a dollar well spent. We look forward to our family photo session this summer and also for a lifetime worth of photographs yet to be taken by Briana. We will be lifelong clients of hers for sure! Briana is incredible! My partner and I are not typically affectionate around other people, and the day of our photo shoot was the first time that we met Briana so we were worried about looking stiff in our photos. The second we met Briana that changed. She instantly made us both feel so comfortable, we laughed the whole time. Another great skill she posses is the ability to think of random cute little ways to make you smile while she is taking the photos, for example, she would say "Okay now Will, whisper to Breana the first thing that came to your mind the first time you looked at her. ", which then would lead to me sincerely smiling and feeling so much love throughout the entire shoot. Getting our photos taken was one of the highlights of my year. I recommend her to any one that I know, she is the best/kindest photographer I know.